“You simply must go – it’s so…. you,” friends would suggest. This beach girl would always respond with the same condescendingly sweet smile. The desert? But when I was invited to speak at a national conference in Phoenix, Arizona at the beginning of April, I decided to take a few extra days to see what all the fuss was about. Arriving at the outskirts of Sedona at dusk, I encountered great difficulty keeping my car on the road – I simply could not take my eyes off the vista enveloping me on all sides. “Whoa,” I automatically exclaimed out loud, even though no one was there to hear. I was converted, to forever be a fan. The red rock buttes in themselves are divinely breathtaking, but with the last vestiges of light dancing on them, the effect was nothing short of surreal. I was not expecting to be so blown away. I made it without incident to my lodgings at the Orchards Inn, a quaint, but inexpensive hotel in the most convenient location right smack in the middle of uptown. While the front faced a myriad of bustling shops and restaurants, to my surprise, my quiet room faced the opposite direction and I was treated to an entire wall of windows which seemed to wrap their arms around a picture postcard view of the red buttes while lying in bed! The next couple of days were jam-packed visiting galleries, shopping for Native American jewelry, quirky objects, a drive to the best view called Airport Mesa, and a short trip to Tlaquepaque Village, a Native American trading post where I stumbled upon my favorite find – a taxidermy rattlesnake for my son. I also dined at the famous Coffee Pot Restaurant, known for its 101 omelet variations. My schedule would only permit time for only one organized tour, either the obligatory healing vortex experience or the infamous Pink Jeep Tour. That’s easy, adrenaline junkies don’t do woo-woo. Now don’t let the word “pink” fool you into a false sense of prissy complacency. The “Broken Arrow” tour is no off-road version of riding side-saddle. The only solo female traveler on the premises and somewhat of a thrill-seeker, I was hoping I’d be riding with a jeep full of testosterone – didn’t matter what age, just the prospect of a wild ride. As luck would have it, I ended up in a group with six middle-aged women – including one particularly squeamish lady named Mary from North Carolina, and a tour driver named Susan. My first thought was “Oh, great, just wake me up when we’re done,” but when Susan read my name from her clipboard, instead of saying “here” yelled, “I call shotgun!” I can be immature sometimes. As it turned out, the other women were all too happy to let me ride in front. Susan looked at my pink sweatshirt and complimented me on matching the jeep. “I thought if I looked official, you might let me drive. No?” I asked. “No,” she said. Well, Susan was a lot more fun than I suspected. She took on those dusty red rocks with seemingly reckless abandon, sometimes driving nearly straight up, and even better, the white-knuckle vertical descents. “Do you want to go faster?” Susan asked the group. “Oh, yeah!” I said. “Yeee-haaw!” It was then that I thought I heard Mary whimper in the back. We drove to several areas with majestic panoramic views. My favorite was a place called “Mushroom Rock” which was a butte on a roundish landing that looked like it dropped sheer off on all sides. Susan gunned the engine and skidded completely around the “mushroom” while we all looked down hundreds of feet, certain we were all going to die. I believe I screamed too. But it was a fun scream, not a scared scream like Mary’s. When we got to Chicken Point, we found some flat rocks that formed a long bench. I gave Susan my camera, sprawled out on my tummy with my arms over my head, holding onto one of the rocks, mouth set in a mock-scream while Susan snapped the shot. Then I gathered everyone around and said, “I’m going to post this on Facebook with the title “Hanging out in Sedona.” I proceeded to rotate the photo vertically, creating an illusion that I was hanging off a cliff. Our little lady group erupted into laughter, especially Mary, who was the first to scramble onto the rock to obtain her own hanging pose shot. The grand finale of the Pink Tour was seeing the sun setting on the buttes, turning them a blazing, iridescent gold as the chill of evening crept into the jeep. Words escaped, but I caught the eye of my new friend, Mary. Even for a writer, sometimes no words are necessary. As the evening wrapped her cold fingers around us, and the smell of dampening earth assailed our nostrils, we reached the end of the Pink Jeep Tour, all of us thoroughly seduced by Sedona’s spell. Filed under Adventure, Girlfriend Getaways, Road Trips, Southwest. Tagged Arizona, Chicken Point, Luggage and Lipstick, Patti Morrow, Pink Jeep Tours, Sedona. Great post, and neat photo trick too! We’ve been thinking about a fall Sedona getaway and now I know that a getting a “hanging in Sedona” pic must be part of the itinerary. The pink jeep adventure looks like a lot of fun — and a little bit scary! So what you’re saying is- Sedona pink jeep adventure!. I like the post a lot, and l’m glad you didn’t edit it. Fun to look back isn’t it? Good post, You shared the amazing experience of your trip. it’s really enjoyable and wonderful destination to visit. What a nice account of your Pink Sedona Jeep Tour. We just tried it last August. And I wore pink, too! But I did not think of that sideways shot!!! Now, I have to go back! That photo op was the highlight of the day — lots of laughs! 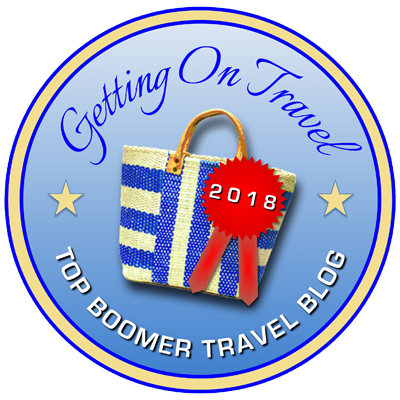 After your pitch in Boomer Travel Bloggers I had to read this post. Love it! So glad you didn’t edit it. I cringed a couple of times, but I let it be. I found it amusing! How nice that this little journey has gotten a “second life.” I used to write for LHJ, too, in the old days of “magazines.” 🙂 I haven’t been brave enough to revisit them. It is fun to read some of our old stuff, isn’t it? Ha! I love it! Especially the sideways shot of you hanging off the cliff. Nothing to be embarrassed about at all!